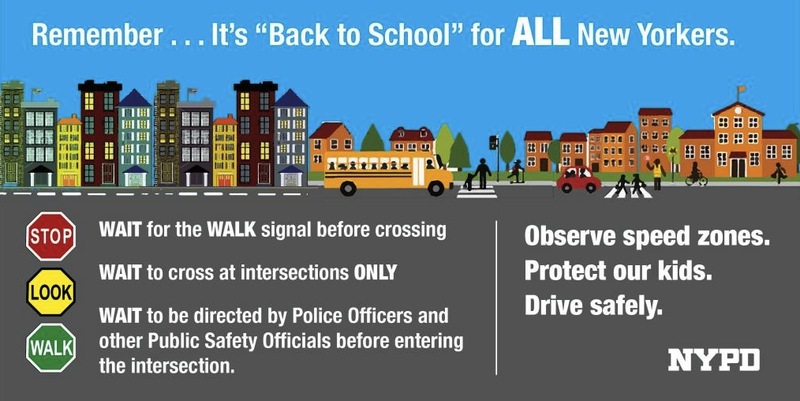 Unless you’re actively involved in school zone street safety or you’re a parent of school-age kids, there’s a good chance back to school hasn’t really crossed your mind. True, Labor Day marks the unofficial end of summer but the weather is still hot, the calendar still reads summer, and not much changes in September for most adults. The truth is though, back to school applies to everyone. A clever campaign by the NYPD reminds New Yorkers that back to school is for everyone. Even if you’re not a parent of young kids, chances are you drive through school zones and need to be alert to changing speed limits, increased foot traffic, and less observant (and smaller!) pedestrians. Avoiding distracting behaviors and being focused and alert behind the wheel becomes even more important as children head back to school. Many cities across the country have issued written statements and safety sheets to help encourage drivers to improve safety with the increase in walking, biking, busing, and carpooling students on the roads. Awareness, coupled with traffic calming measures to slow cars down, can go a long way to improving safety on local streets. With car accidents a leading cause of death for young children in the US, it’s important for drivers to recognize that their choices behind the wheel can actually save a life. Even for cities where back to school didn’t go as safely as planned, it’s not too late to make a difference. Educational campaigns are a great tool to remind local drivers to be alert but physical, ongoing solutions arean important part of safe school zones. Whether speed humps or cushions to compel drivers to slow down or flashing beacons and speed display signs to remind them of lower speed limits, traffic calming solutions can help ensure that students are safe in school all year long. PreviousPrevious post:5 Things You May Not Know About Pedestrian & Bicyclist SafetyNextNext post:#Radar #Speed #Limit #Signs installed @Defence Campus! Traffic Logix steps forward to make roads safer!